Worried about the quality of your training? Techletter is at the core of in-house training at many pest control companies. Imagine yourself stuck in a sewer manhole as the water level rises. Or sinking in stored bulk grain and unable to breathe as the grain closes over your head. Or trapped in an elevator pit as the elevator slowly crushes you. Such thoughts could give you nightmares! These gruesome examples of “confined spaces” are why the Occupational Safety and Health Administration (OSHA) has special rules for entering a confined space that is particularly hazardous—a “permit-required” confined space. Many workplaces contain spaces that are confined AND hazardous. Many workplaces contain spaces that are “confined,” meaning that you may have to work while cramped, restricted or contorted, or else you must squeeze through a small opening to enter. A crawlspace is a confined space. But if you add an additional hazard such as asphyxiation, entrapment, toxic gases, crush injuries, fire or explosion, then that space becomes a “permit-required” confined space. Examples of permit-required confined spaces in pest control include grain storage bins and sewers. More examples of permit-required confined spaces. Before you can enter such a permit-required confined space, you must comply with a long list of OSHA rules. The first and most obvious is that you must first obtain a permit signed by an “entry supervisor.” You must follow a written program specific to that site, and have been trained for entering such spaces. Depending on the hazards at the site, there might need to be air monitoring and ventilation equipment, a stand-by rescue team, rescue equipment (ladders, hoists), isolation of the space (lockout/tagout, police tape), and special personal protective equipment. Pest control companies often avoid the complications of OSHA requirements by (1) training technicians to recognize a permit-required confined space, and (2) having a policy that technicians may not enter any permit-required confined space. Click to see official OSHA definitions related to confined spaces. In some areas of the country, PMPs control pests in and around bulk stored whole grains. Examples include silos, bulk storage bins and hoppers, ship holds, and grain rail cars. Look inside a full grain bin. At first glance, it doesn’t seem dangerous. But don’t be fooled, and don’t even think about walking on the grain without proper equipment and training. People die each year entrapped in grain. Grain can act like quicksand to pull you under. The grain surface that looks so solid can fool you. Grain can act like quicksand to pull you under. You can be completely engulfed in grain in eight seconds and suffocate in a matter of minutes. Even if you are not completely engulfed, carbon dioxide generated by grain can suffocate you at the surface. If you sink only to your waist, you still won’t be able to pull yourself out of the grain; a rescue team will be necessary. Grain bridges also form in stored grain. Since grain is emptied from the bottom, a void forms below the crusted surface (the bridge), which looks solid but can suddenly collapse, burying you under thousands of pounds of grain. There are two other entrapment hazards in stored grain. Grain can set up in a large mass against the bin wall in a partially empty bin. When it is disturbed, it can cascade down like an avalanche and bury workers below. Also, never enter a bin, grain rail car, truck, wagon box, or auger pit where grain is actively flowing out, even if the grain is shallow. As grain flows out of the holding area, it creates a suction action so strong that a person cannot swim, climb, or walk against it and escape. The victim will be pulled under very quickly with no time to react. Because of these hazards, grain storage facilities are usually considered to be permit-required confined spaces, requiring safety harnesses and equipment, rescue team/partner, respirator, and other safety practices and equipment detailed in a written confined spaces program. You can be engulfed and trapped if water or sewage suddenly floods the sewer system. You may be exposed to toxic gases, particularly hydrogen sulfide. Other gases, such as methane (sewer gas), can cause a fire or explosion. The air you are breathing may be deficient in oxygen (below about 20%), which could cause you to lose consciousness. 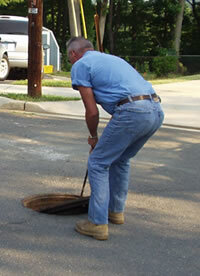 Most technicians should not enter sewer manholes. Most pest control work (rats, cockroaches) can be done from the surface anyway. An exception might be a technician doing work for a municipality or for a large food processing facility. 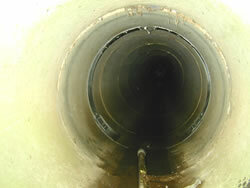 He or she may, on occasion, enter sewers to place rodent baits, remove dead rats, etc., but only if both the owner of the sewer (the sewer service authority or the food processing plant) and the pest control company have written permit-required confined spaces programs in place and follow a long list of other rules. Do not attempt a rescue unless you are trained and equipped to do so. 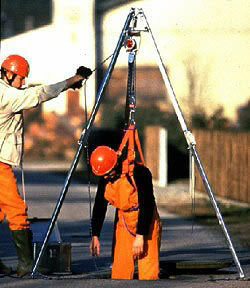 Over 50 percent of workers who die in confined spaces are attempting to rescue other workers. This type of rescue is challenging and dangerous. Do not try to rescue a coworker trapped in a permit-required confined space unless you are trained and equipped to do so. Instead, call the proper rescue team or 911. Otherwise, your first unplanned rescue could be your last. Click to see key points to remember about confined spaces. This article is from the newly revised Pest Control Technician Safety Manual. 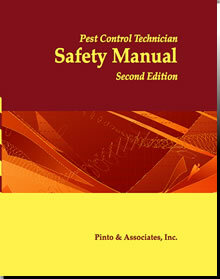 For more information, or to order your copy, click Safety Manual.